In a previous post on tricycles, I featured some photos taken from various trips I’ve taken around the country. Closer to home are tricycles that provide some convenience to commuters along a stretch of C-5 that is more commonly known as Katipunan Avenue. 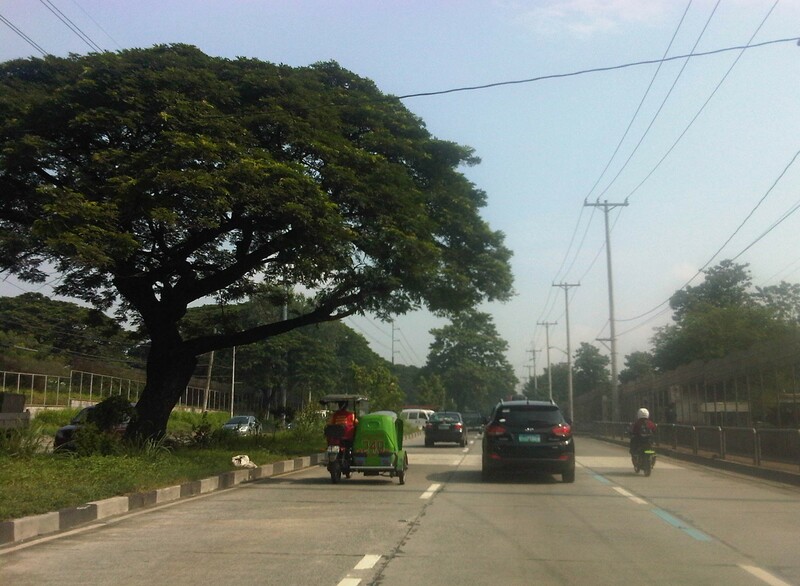 The example below is of a typical tricycle traveling along a section that cuts through lands of the University of the Philippines Diliman. Tricycles do not necessarily just roam around to get passengers like what we usually see. They do have formal terminals though the informal ones outnumber these and typically cause problems due to the spaces they tend to occupy. These spaces include road space, the consequence of which is a reduction in road capacity, and sidewalks, which deny pedestrians space for walking. The first causes or exacerbates congestion while the second mainly puts people at higher risk as pedestrian safety is compromised. Following are photos of tricycle terminals taken from recent trips north of Manila in the provinces of Tarlac, Pangasinan and La Union. Tricycles still dominate traffic along the Manila North Road in Urdaneta, Pangasinan where they have terminals around the public market and at the intersections of side streets. Roadside tricycle terminal in La Union where the newly paved shoulders are occupied by tricycles waiting for passengers from a nearby public school. Tricycle terminal in front of the Civic Center in Agoo, La Union and just across the church. More on tricycles and their terminals in succeeding posts! By d0ctrine in Governance, Motorcycles, Public Transport on November 4, 2013 . Are these all Taxi’s? Do some people have these for private transport? These mostly operate as taxis but there are many which are registered for private use but are being used for public transport. The belief by many is that they can just attach a sidecar to a motorcycle and then charge people for transport – another issue in many Philippine towns.